Tufts Cummings School of Veterinary Medicine - website - 508-839-5395 Emergency service is available 24 hours a day, 365 days a year. It is recommended that you call in advance whenever possible, to prepare the staff for your arrival. 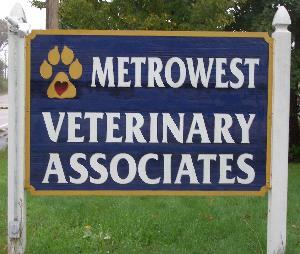 Cases are seen at the Foster Hospital for Small Animals, located on Route 30 in North Grafton, just over the Westboro town line directions to Tufts. BLUE PEARL VETERINARY - website - 781-684-8387 Veterinary Emergency & Specialty Center of New England. Emergency service is available 24 hours a day, 365 days a year. Located at 180 Bear Hill Road in Waltham, at Exit 27B on Rte 95/128 directions to VESCONE. Animal Emergency Center at NEAMC - website - 508-580-2515 Emergency service is available 24 hours a day, 365 days a year. Located at 595 W. Center Street (Route 106) in West Bridgewater on at Exit 16B on Rte 24 directions to AEC. Emergency center information may also be obtained by phoning the clinic after hours and selecting choice "2" during the recorded message. Phone messages may also be left after hours by selecting choice "3" and following the prompts. Phone calls will be returned when the clinic reopens.